Go to Trackside NOW at for Monday's live race updates. 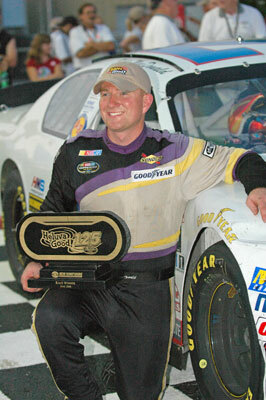 Eddie led 120 of the first 132 laps, cashing in $12,000 in lap leader bonus money. Winner Cup star Kevin Harvick dove inside Eddie on lap 132 to take the lead and hold it to the checkers. After drawing the Pole for Heat 3, Eddie led from green to checkers to earn the 3rd place starting spot on the grid of 42 cars out of 86 competitors present! 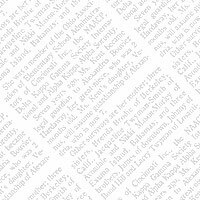 Go to the Speed51 Grid Chart for the full layout of the starting grid and how it was built. 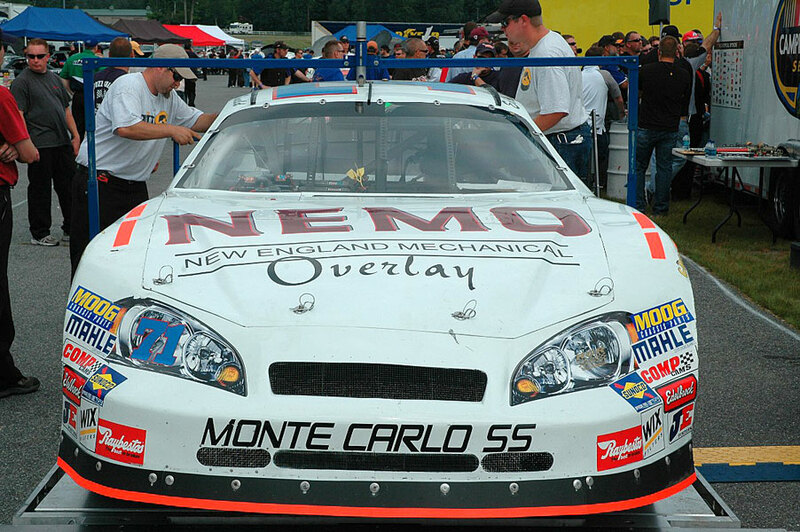 With one half of Eddie’s and Rollie’s goal to win at Loudon and Oxford realized, the dynamic duo came within a set of tires of winning the famed TD Bank North 250 in the rain delayed Late Model classic on Monday night, July 21st. Eddie dominated the first 126 laps in a show of power and handling. Eddie and Rollie have achieved great success with this car especially at Oxford in the ACT Tour races this season. Eddie started the race in the third position after winning his qualifying heat on Sunday before the rains washed out the rest of the program. When the green flag finally waved after an extended rain delay, Eddie made one of his typical outside power moves to take the lead from the pole sitter on lap six and wowed the crowd with the impressive display. Over the next 120 laps, Eddie fought off several challenges including those made by Cup driver Kevin Harvick, Joey Pole, and Shawn Martin. 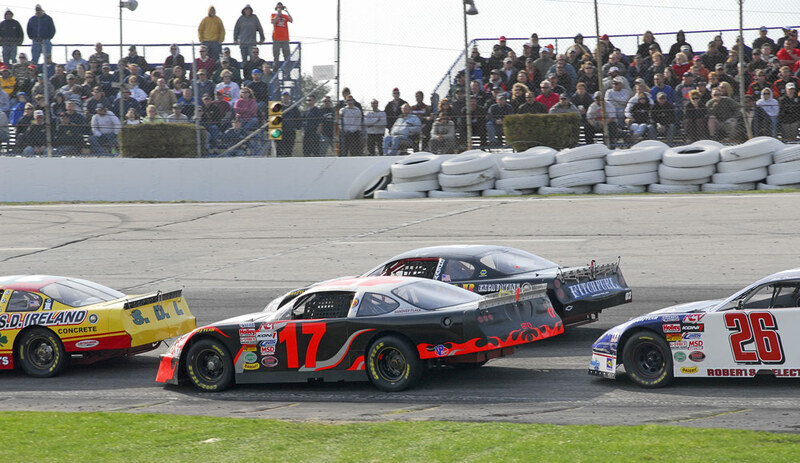 The #17 was a rocket and could easily open up three to five car length leads after a few laps on each restart. Even nine caution flags in the first half of the race could not slow the veteran Rowley, Mass. driver as he repeatedly fought off any and all challenges. 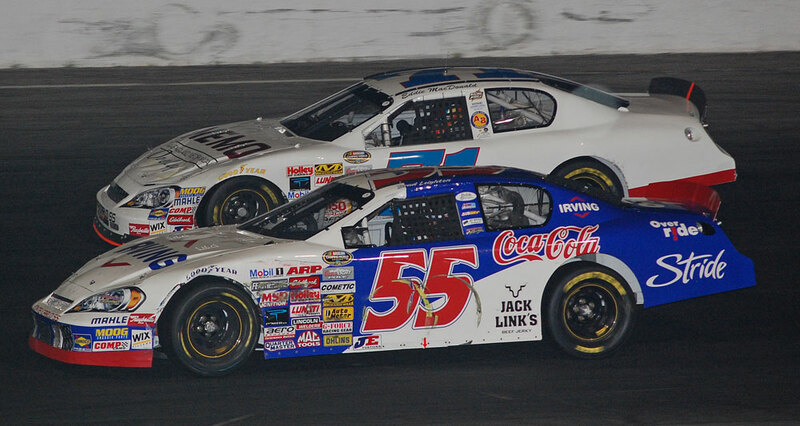 Joey Pole made an inside pass for the lead on lap 52 but Eddie was able to take the lead back two laps later. “The car was fantastic. It was fast and handled extremely well. I was a little loose getting in the turns but it was great. The bottom was the fast way around but when I got a few car lengths lead I moved up the track to save the tires and it worked great. When the car is this good you can drive it anywhere,” Eddie said after the race. However, the mandatory five-minute pit stop for all competitors on lap 126 proved to be the undoing for the team’s run for first place and the $25,000 to the winner. After the break, Eddie started on the pole with Harvick on the outside but it became evident very quickly that something was not right with Eddie’s car. Harvick took the lead on lap 129 and Eddie’s car started to fall back. “During the break we put on two sticker tires and two scuff tires from the qualifier but the stagger was way off and the tires just never came in like we thought they would. We knew they were not like the first set so we tried to adjust them with air pressure but it didn’t work. The car was loose getting in, tight in the center, and loose getting off,” said a very disappointed Eddie. Eddie’s 24th place finish in the Strutmasters.com 150 at the Music City Complex in Nashville ended a night of frustration for the Grimm/Nemo sponsored Chevy that began with mechanical problems with an aircraft. Crew chief Rollie LaChance’s plane developed oil problems prior to take off that left him stranded in Boston unable to make it to Nashville on time for the race. Without LaChance calling the shots in practice the team struggled to post 17th fastest runs in both practices. Eddie managed to qualify the car in twelfth with a time of 19,772 seconds (108.517 mph). The plan was to just run the car without loosing any positions but more bad luck was on the way. “We knew the car was not fast so we just wanted to hold our ground and hopefully avoid the wrecks and pick off the cars that we could. Obviously it didn’t happen that way. The crew did a great job getting the car ready, but without Rollie there we knew we were in for a struggle. I was just cruising along when the #03 spun in front of me on lap 21 but I was able to get the car stopped without making contact. The car behind me didn’t stop and plowed me into the #03 causing a lot of damage,” said a very frustrated driver. 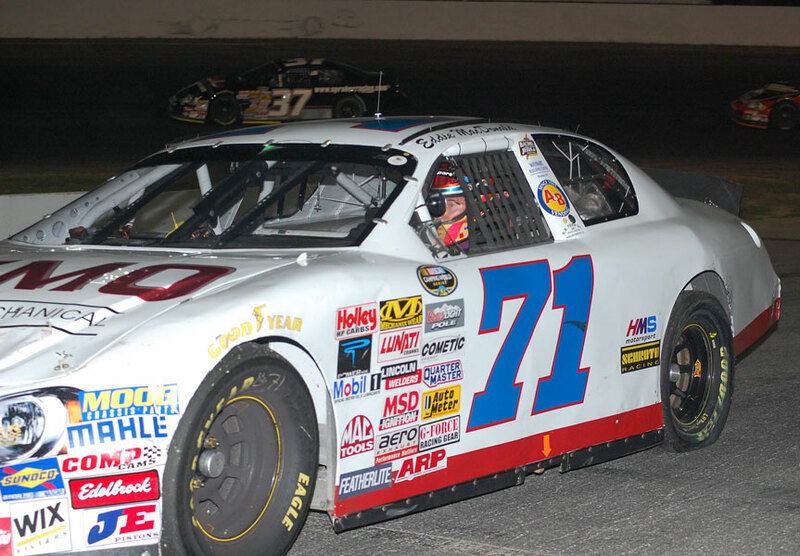 After a couple of trips to the pits for repairs, the #71 returned to the track and was able to run in the 19th position until another problem on lap 85 forced the Rowley, Mass. driver to the pits for the final time of the race. “The fuel pump quit on us and that ended a miserable night. This has to be one of the most frustrating nights we have ever had. Nothing seemed to right from the start. Without Rollie, the car not running well, and getting hit early the whole day was an uphill battle that we lost. Everyone tried their hardest but it didn’t seem like anything was going in the right direction for us. The fuel pump quitting was the final straw but we will regroup for next week’s race at Adirondack next week. We will feel sorry for ourselves tonight but there is no quit in this team. This was a tough night for our team owner Rob Grimm but he’s always there supporting us every race with his positive attitude. We’ve been in situations like this before and bounced back and that’s what we will do this week,” said Eddie after the race. The team boasts one win this season with three top five finishes so they will be looking to turn things around for next Saturday’s, July 26, Edge Hotel 150 NASCAR Camping World Series East race at Adirondack International Speedway. 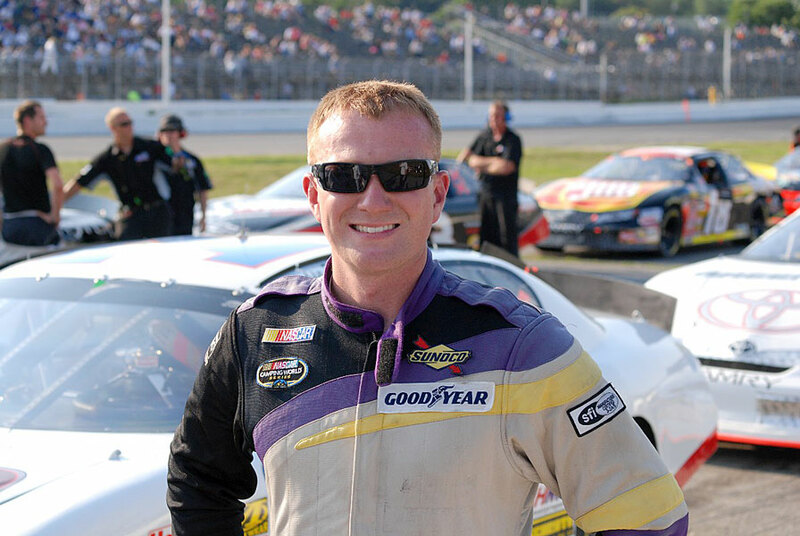 Eddie fought an ill-handling racecar and a late race flat tire to finish 15th in the Camping World Series East Full Fender Frenzy 100 at Thompson International. After the huge win at New Hampshire Motor Speedway, Eddie and the team had high hopes for another solid finish but things did not turn out as planned. When the green flag waved, Eddie started in the third position and immediately lost three spots when the pole-sitter did not have a good start. By lap 15, the No. 71 was running in seventh place despite the tight condition. The Rowley, Mass. driver was able to maintain that position and after two caution flags on laps 33 and 38 moved into fifth place. 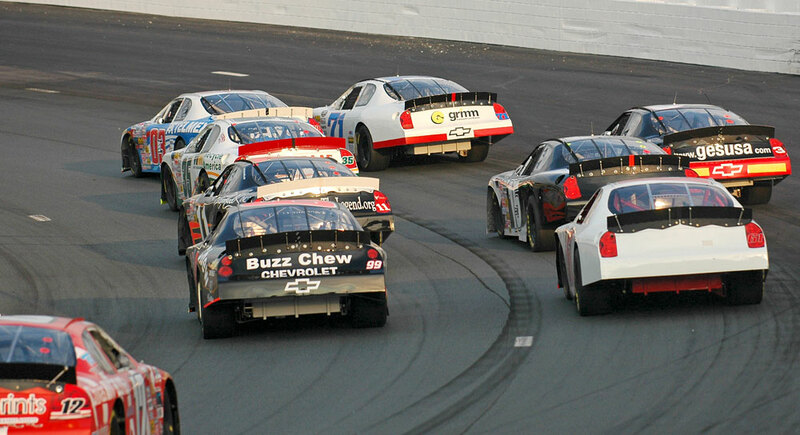 However, the handling of the car worsened and Eddie dropped back to eighth on the lap 57 restart. The 15th place finish drops Eddie one position to seventh in the point’s race. 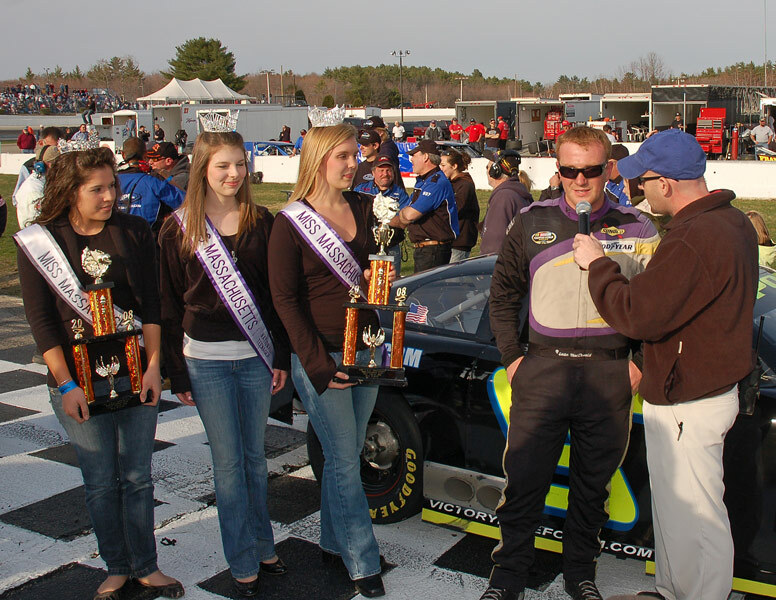 With the win at NHMS, the team is guaranteed a spot in the Toyota All-Star Showdown to be held at Irwindale Speedway in California scheduled in January 2009. Eddie and the crew will perform double duty next weekend. 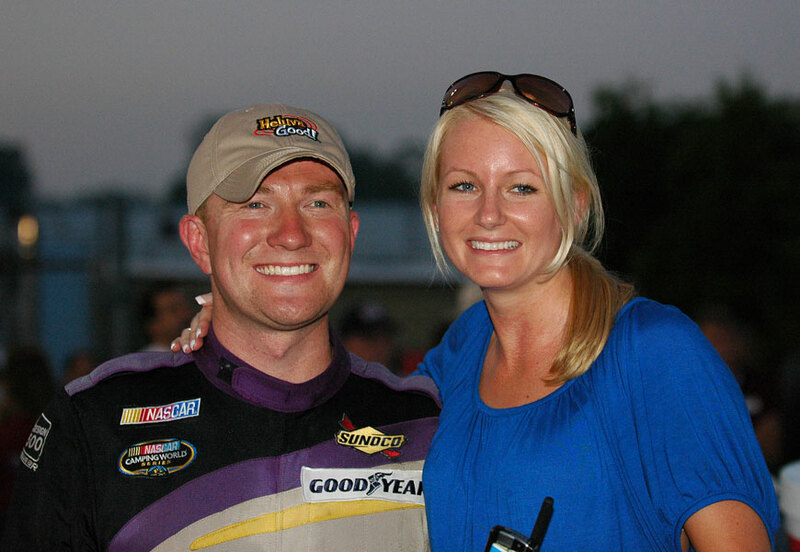 On July 19th they will race in the Camping World Series East event at the Music City Motorplex in Nashville, Tenn., then fly that night to Portland, Maine to race the next day in the famed Oxford 250 at the Oxford Plains Speedway. "This is just awesome. It hasn't really sunk in yet." Eddie posted his first ever win at New Hampshire Motor Speedway and did so in dramatic fashion with a fantastic green-white-checkered finish in the NASCAR Camping World East Series Heluva Good! Summer 125. 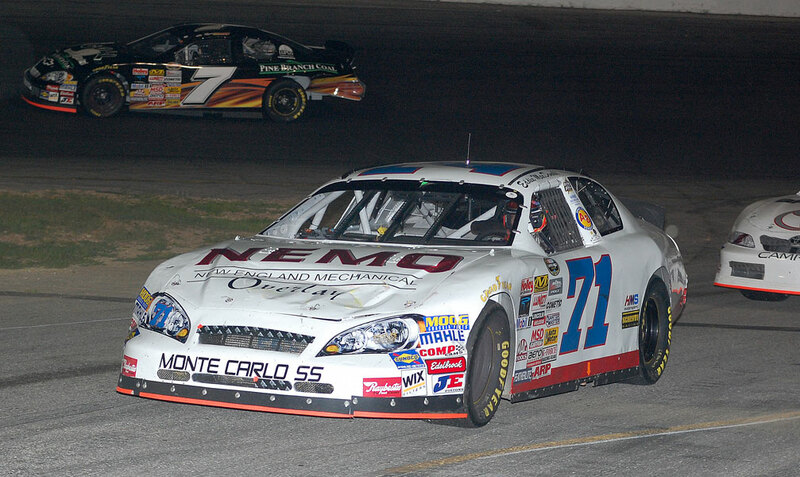 The NEMO/Grimm Construction sponsored Chevy battled the #1 car door-to-door swapping the lead several times over five laps until a caution flag on lap 122 forced the overtime. An excited Eddie said of the restart, “The one car kept driving into me before the caution so I just wanted to get away from him on the restart since he was a little erratic in the turns. 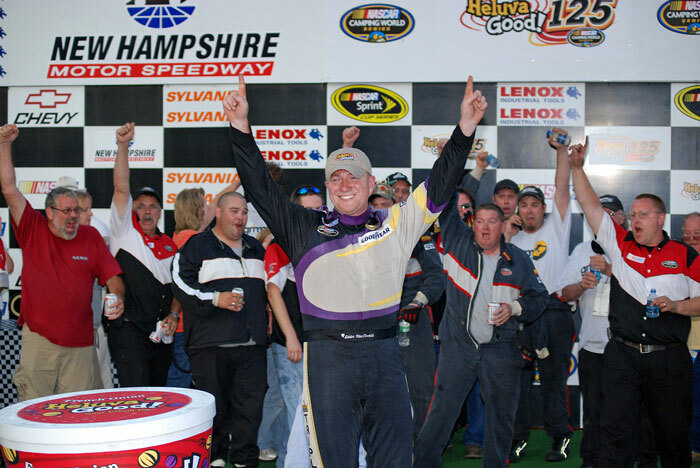 I knew I had a great car and I was able to pull away for the win.” The win is also the first NASCAR win at the newly renamed New Hampshire Motor Speedway and will be long remembered as one of the most competitive races in the series at the track. Due to Thursday’s washout, Eddie started tenth in the race based on point’s standing. During the morning practice session the #71 tied for ninth fastest with a time of 31.116 seconds (122.406mph) around the “Magic Mile”. When the green flag waved Eddie began his march to the front and by lap 20 he was in third place. On lap 22, he pitted for fuel only, returning to the track in the 13th position then moving through the field and into sixth when another yellow flag flew on lap 35. Four of the leaders pitted and when the green flag waved, Eddie passed the #03 on the lap 41 restart for the lead, holding it for 30 laps. A caution on lap 82 allowed Eddie to pit for right-side tires then marched through the pack from his 21st position narrowly missing a huge back stretch wreck on lap 101. The NASCAR Camping World East Series will race next at the famed Thompson International Speedway on July 12 where Eddie has a previous victory. 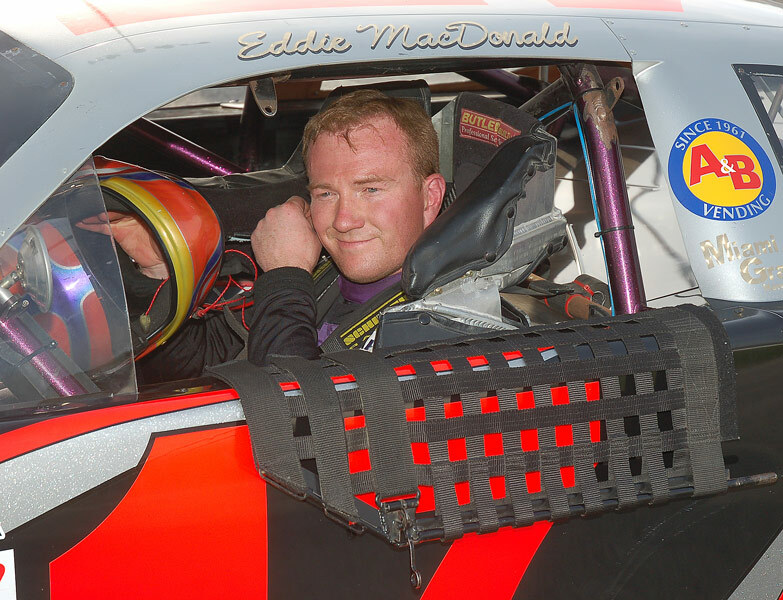 Eddie added another top five finish with a solid second place run in the ACT Late Model Tour’s Dunkin Donuts 159 at Maine’s Oxford Plains Speedway on Saturday. Eddie started 18th in the field then made his typical run to the front with relentless outside passing. Starting deep in the field in his qualifying heat, Eddie needed to finish fourth but came up one spot shy and had to race in the last chance consi. Starting on the pole in that one, Eddie won easily for the 18th position on the grid. Fifth-one cars attempted to qualify for the 33-car field. Eddie and the Grimm Construction Chevy team will run next as part of the big Cup weekend at New Hampshire Motor Speedway in the NASCAR Camping World East Series this Friday June 27th. Practice and qualifying will take place on Thursday. Eddie’s race in the NASCAR Camping World 125 at Watkins Glen International came to an end on lap six with a blown engine. The Grimm Construction Chevy qualified 13th and the veteran driver had hopes for another top five finish this season but it came apart very quickly. With the DNF, Eddie slipped from fourth in the points to eleventh. 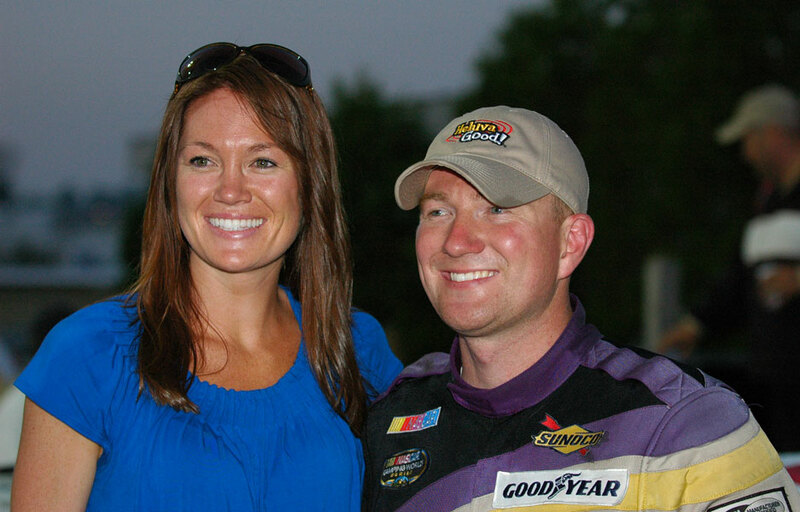 The Grimm Chevy finished third at Greenville-Pickens to open the season, then posted a fourth place finish at South Boston Speedway in the last race. The only blemish in the first three events was a 37th place finish at Iowa Speedway after getting into a wreck on lap 67. 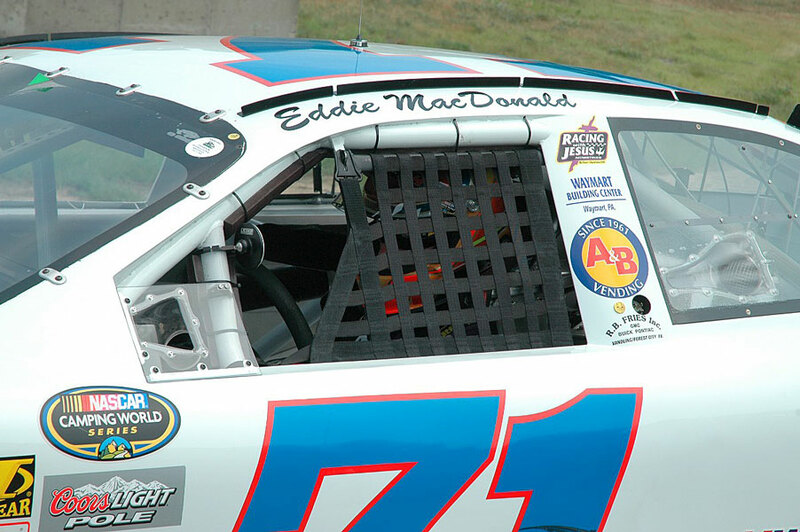 MacDonald’s only run at the Glen was a third place finish in 2004, so expectations were high for another solid run. “ We really improved quite a bit form our first practice (21st on the charts) to our second practice run (12th on the charts) and we were a second and a half faster qualifying (76.305 seconds-115.589 mph) so we knew we had a car to compete. But those things happen and there is nothing you can do about it. Hopefully we can rebound from this and have a great run at Loudon. I just feel terrible for Rob Grimm and all our sponsors. The team really works so hard, it is really disappointing but we will bounce back. It is a long season,” Eddie speculated. The Grimm Construction crew is already preparing the car to compete in the NASCAR Camping World East Series 125 at New Hampshire Motor Speedway June 26-27. Eddie scored his second top five finish in three races in NASCAR’s Camping World East Series with a fourth place run in the Strutmasters.com 150 at South Boston Speedway in Virginia. The Rowley, Mass driver was competing in his 100th start in the series. When the green flag waved, Eddie was in the 16th spot and was maintaining his position when he was hit from behind causing him to spin out. No caution was thrown so by the time Eddie gathered the Grimm Construction Chevy back up, he was at the tail of the field. “There was a wreck in front of me and I slowed down but someone got into me. We went to the back and we just decided to take it easy, stay out of the wrecks, and pass cars one at a time when we could. It worked out pretty good and we were able to get a good finish out of it. The tires were used up pretty bad after coming from the rear so we didn’t have much left to challenge the leaders. This place is pretty neat. It’s like a cross between Lee USA Speedway and Thompson International. It was a lot of fun racing here because Rob Grimm gives us great cars and equipment. I also want to thank NEMO, A&B Vending, Waymart Building Center, and all the people who give us so much help and support,” said a very pleased Eddie. The car was 21st fastest in the first practice session and after making some adjustments, Eddie improved to 17th fastest. After more adjustments, the Grimm Construction Chevy cut nearly a half-second of the first practice time. The team will be busy preparing for the June 8th race at Watkins Glen International. Eddie has a third place finish in his debut at the famed road course and hopes a repeat performance is in the cards. Started 20th of 44 cars - Completed 149 laps for 38th place. Eddie’s hopes for a top ten finish in the Camping World US Cellular 200 at Iowa Speedway ended with a wreck on lap 67. The crew was able to get the Grimm Construction Chevrolet back on the track but many laps down. That was not to be the case when on lap 67, the #35 moved under Eddie while the 08 made it three-wide on the back straightaway. 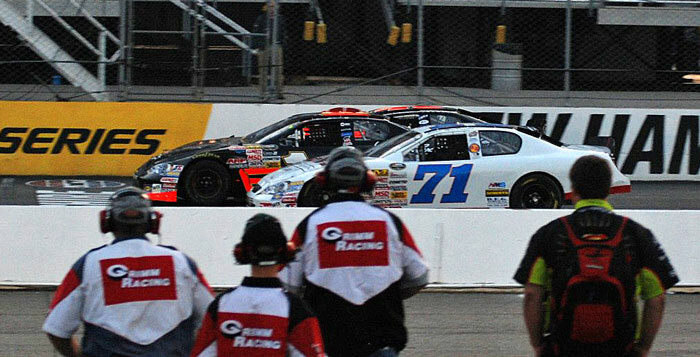 Eddie’s #75 made contact with the 08 sending him into the wall. The crew made the needed repairs behind the wall but returned to the track 32 laps down. More repairs were needed relegating Eddie to the 38th position. Even though the race did not pan out as planned, Rob was optimistic saying, “ We looked good early. The crew did a fantastic job getting us back out there after the wreck. Everybody pitched in, got it back out there and we finished. We gained a few positions that will be important for the points at the end of the year. 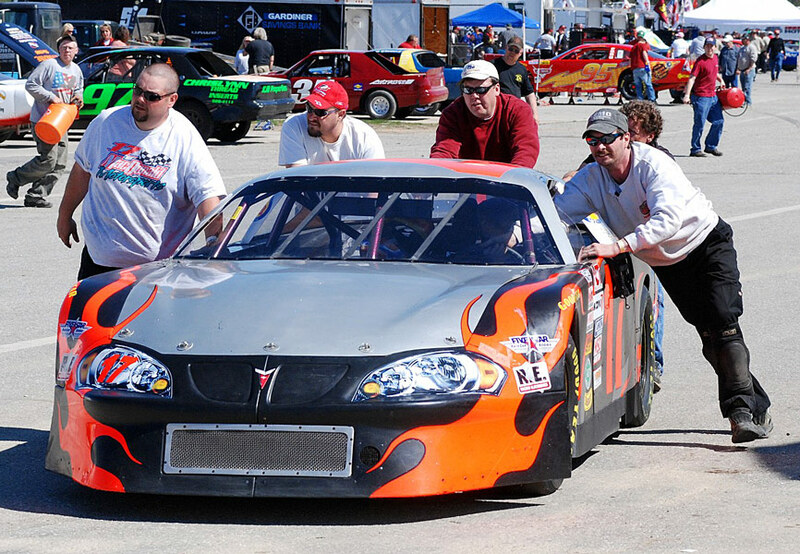 The crew will next be preparing for the NASCAR Camping World Series Strutmasters.com 150 at the South Boston Speedway on May 31. Eddie came from 17th to 4th & had a lengthy battle with Brent Dragon for 3rd during a long green run. With a 2nd and a 4th, Eddie should be near the top of the ACT points standings. After a solid finish in the Camping World Series opener at Geenville-Pickens Speedway Saturday night, Eddie headed to his home track at Lee USA Speedway to participate in the Governor’s Cup 100 in the ACT Tour series opener Sunday afternoon to finish second. Before a huge opening day crowd, starting positions for heats, consi, and a B-main determined the thirty starting positions of the 51 ACT cars in attendance, while using a plus-minus points system. Eddie started eighth and finished fourth in his heat with a tremendous three-wide outside run. By virtue of his plus 4 rating, Eddie started fifth in the feature. Eddie was able to use the outside groove again as he battled to maintain his position. Eddie decided to take it easy to save his tires for the end. A restart on lap 66 hurts Eddie’s chances when lapped cars were allowed to restart in front instead of sending them to the rear. This really set up a battle to get to the front to challenge Joey “Pole”. 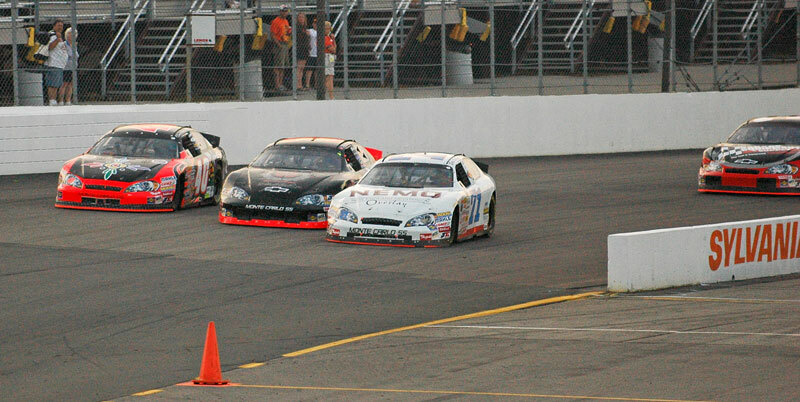 After getting through the lapped traffic, Eddie had to deal with Scott Payea, Randy Porter, and Chris Michaud so he could get after the leader. After moving into second place on lap 82, Eddie set his sights on the leader but just ran out of laps. “I probably waited to long to get going but that restart really hurt. I was closing in on Joey and I think if I had a few more laps I could of got him. Really though, we are happy with the second place run and we will give it another try next week at Oxford Plains,” said Eddie after the race. Eddie and the team posted their first win at the famed Oxford oval last year and would like nothing better than to return to victory lane. fought his way thru the pack to a 5th Place Finish! The Place - Greenville-Pickens Speedway, Greenville, S.C.
Eddie came from the back of the pack to score a solid fifth place finish in the An American Revolution 150 at the famed half-mile track. Starting 28th in the 30-car field, Eddie stayed out of trouble to move the Grimm Construction Chevrolet to a very respectable top five finish in the Camping World East Series opener. “We were just terrible in practice. The car was just sliding all over the place. The crew went to work and changed a number of things for qualifying. Usually Rollie dials it in but this time it just didn’t work out,” said the frustrated driver after his run. After running 26th in practice the Grimm Chevy did pick up three tenths of a second but fell short of qualifying for the race. The team made it to the feature on an owner’s provisional, starting near the tail. “Because it was an impound race, we did not have a chance to adjust anything on the car. All we could do was to get out there, steer clear of any crashes and move up when we had the chance. I knew if we could miss the wrecks that usually happen in the back, then I could start picking them off one at a time and that’s what happened,” said Eddie of the only strategy available to the team. The NASCAR Camping World Series East opens its 22nd season Saturday, April 19 at historic Greenville-Pickens Speedway in Greenville, S.C. An exciting and unpredictably competitive season is forecast for the 13-event schedule, which takes the series to a dozen tracks in nine states. The departure of 2007 series champion Joey Logano to the NASCAR Nationwide Series assures a first-time series champion in 2008. An outstanding rookie class is assembling. Determined veterans, meanwhile, are primed for a run at the championship. Other variables to monitor are new driver/team combinations and the performances of four NASCAR national series teams fielding efforts for seven drivers. After months of preparation, MacDonald Motorsports and Robert Grimm Racing, LLC are excited to announce their plans for 2008 season in the NASCAR Camping World Series. 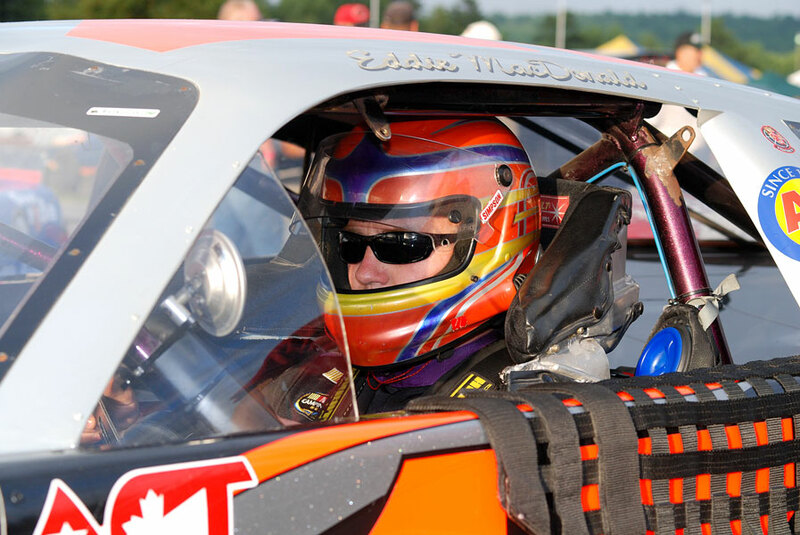 MacDonald Motorsports with Eddie MacDonald and Rollie Lachance will be combining forces with Robert Grimm Racing (RGR) for the 2008 Camping World Series season. 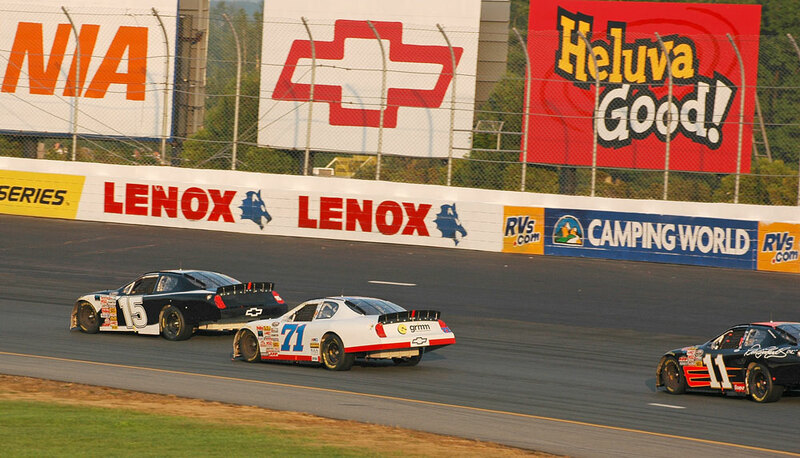 They will be fielding the #71 Chevy Monte Carlos of Robert Grimm Racing (RGR) full time under the East Series banner. MacDonald as driver, Lachance as crew chief and Grimm as car owner. 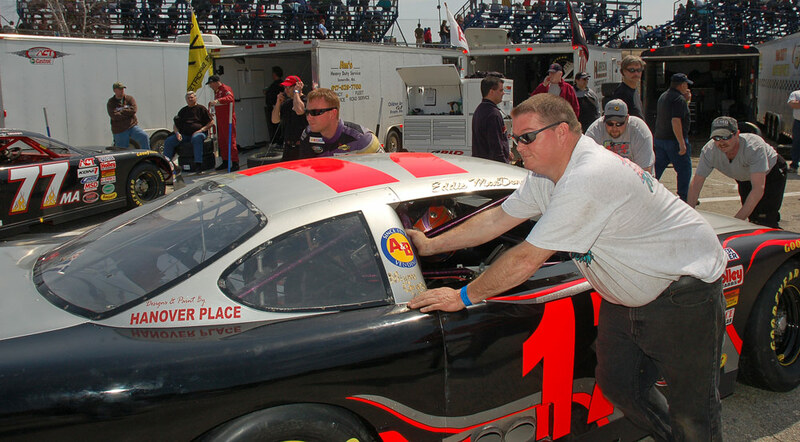 MacDonald's success in 2007 includes his season debut at Stafford Motor Speedway in Victory Lane and the top 5 finish at the 2007 All-Star Showdown in Irwindale, CA. MacDonald Motorsports will be parking their #48 for the #71 full time ride with RGR. 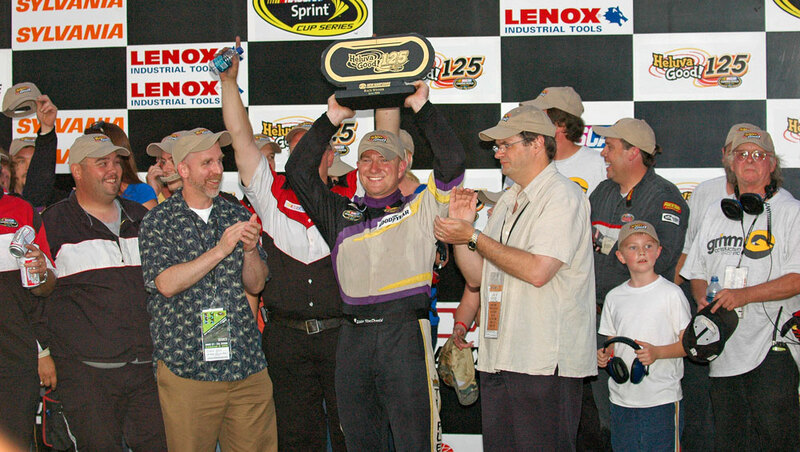 "I had a good season in 2007 running part time in the #48 and part time in the #71 for Rob (Grimm) but this opportunity to run full time for Rob and still with Rollie as my crew chief was too good to pass up", stated MacDonald. "Rob has been busy the past few months getting us really good competitive equipment for the'08 season. Combining teams is something that Eddie and I are really looking forward to", continued Lachance. Lachance has been MacDonald's crew chief for the past three years in the NASCAR Camping World Series (formally the Busch East Series) and together they have two wins during that time. 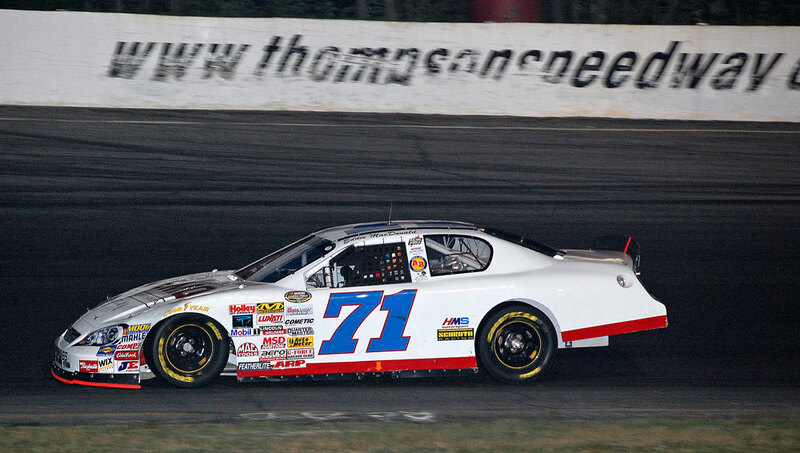 Robert Grimm Racing entered the NASCAR Camping World Series arena in 2007 having MacDonald driving select races in his #71 Grimm Construction Chevrolet. 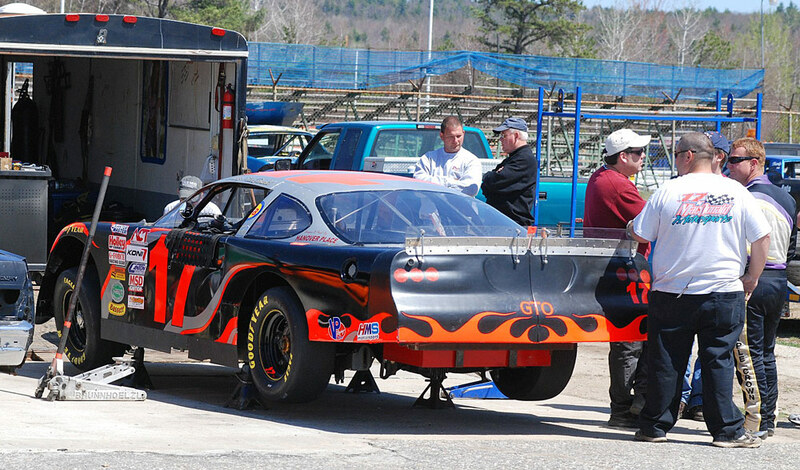 His best finish in the #71 was 5th at Adirondack Speedway. "Last year I was learning about this series and with the help of Eddie and Rollie, I decided I wanted to do it full time in 2008. Those guys (Rollie and Eddie) have proven they can get it done with a limited budget. I'm looking to make it easier for them to get it done more often with more equipment at their disposal", reports Grimm. "I'm looking forward to becoming a full time car owner in 2008. We are concentrating hard on preparing for the upcoming season with competitive equipment, personnel and sponsorship inquiries", continued Grimm. 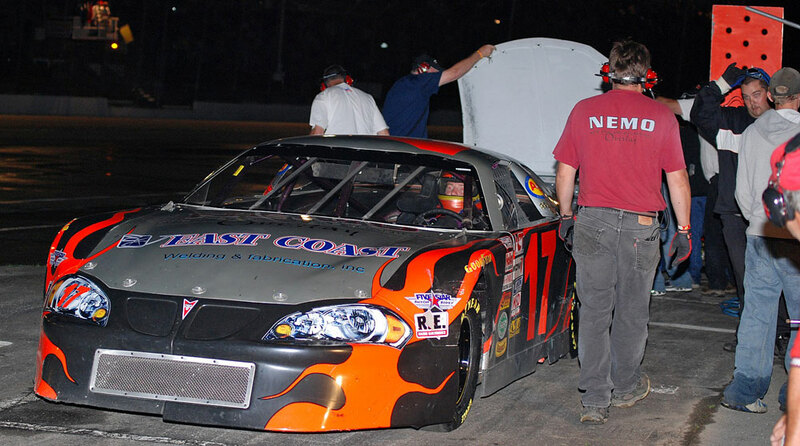 The '08 season will begin on April 19 at Greenville-Pickens and with that Robert Grimm Racing's goal will be to show up at each event with a car capable of running in the top 5. RGR realizes that the NASCAR Camping World Series has many top notch teams and hopes to become one of them. For more information on sponsorship opportunities with R.G.R. contact Robert Grimm, Owner, at 570-488-9700. DAYTONA BEACH, Fla. (Dec. 15, 2007) – Several new tracks join a list of historic venues that will make up the 2008 NASCAR Camping World Series schedule, as the top developmental series in NASCAR presents a stronger, more geographically diverse mixture of short tracks, speedways and road courses across the United States. Also today, NASCAR announced that beginning in 2008, Camping World would be the new title sponsor for the sport’s long-standing Grand National Division, East and West Series. The NASCAR Camping World Series calendar will run on 23 tracks in 16 states, including a return trip to Iowa Speedway for a combination race between the East and West on the 7/8-mile tri-oval in Newton, Iowa. Last year’s event drew almost 25,000 fans that witnessed an epic battle in which 17-year-old Joey Logano, the eventual 2007 East champion, outdueled 2007 Daytona 500 winner Kevin Harvick to claim the victory. Five NASCAR Camping World Series events will run in conjunction with NASCAR Sprint Cup Series race weekends in 2008. 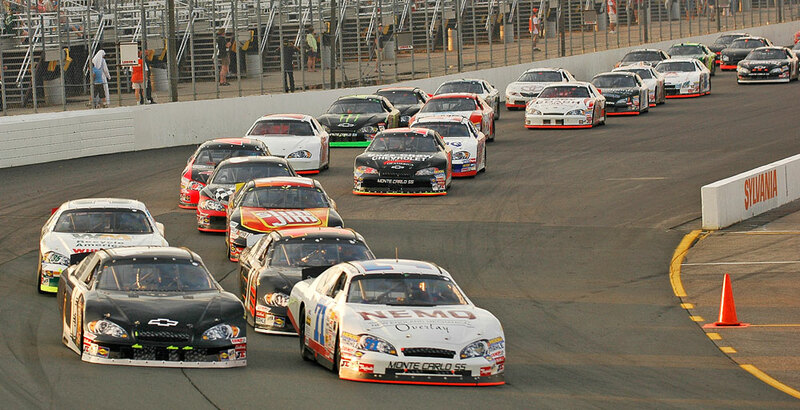 Additional companion events are scheduled with the NASCAR Whelen Modified Tour and the Grand-Am Rolex Series. The schedules for the NASCAR Camping World Series East and West will each include 13 races. 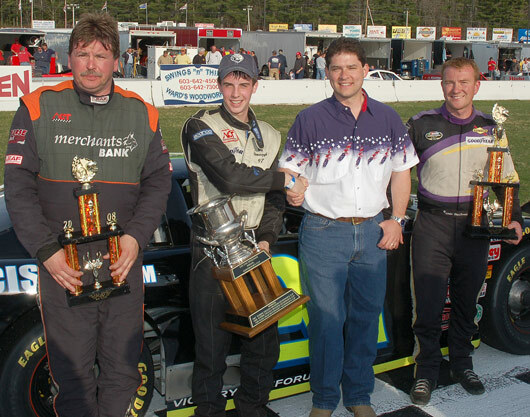 The East will take the green flag for the first race April 19 at Greenville-Pickens Speedway in Greenville, S.C. 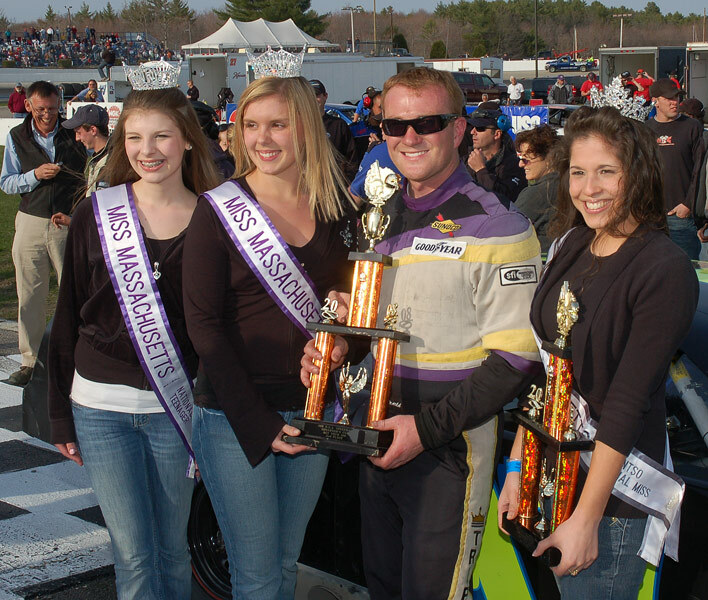 The East season will conclude Sept. 28 at Stafford (Conn.) Motor Speedway. 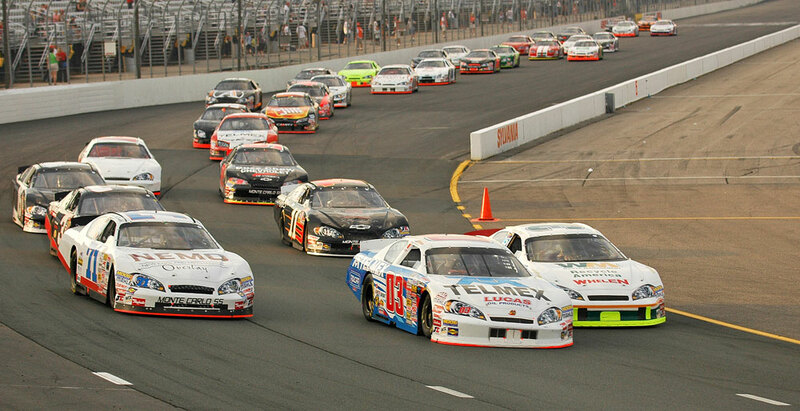 - The 2008 NASCAR Camping World Series schedule includes races on four road courses. The East will run at Lime Rock Park in Connecticut, in addition to the first trip to Watkins Glen International since 2004. The event at The Glen will run in conjunction with the Grand-Am Rolex Series. - The East includes return trips to a number of historic southern tracks: Greenville-Pickens Speedway in South Carolina — where the series will open the season for the third year in a row — Virginia’s South Boston Speedway and the Music City Motorplex at the fairgrounds in Nashville, Tenn. The East will also maintain its northern roots by racing at Thompson International Speedway and the season finale at Stafford, both in Connecticut, as well as returning to Adirondack International Speedway in Beaver Falls, N.Y.
- Conjunction events with the NASCAR Sprint Cup Series include two weekends at New Hampshire Motor Speedway (June 27 and Sept. 12) and Sept. 19 at Dover International Speedway for the East. - The East events at Mansfield Motorsports Park Aug. 23 and Stafford Sept. 28 will be run in conjunction with the NASCAR Whelen Modified Tour. The broadcast schedule for the 2008 NASCAR Camping World Series aired on HD Net and Speed will be announced in the near future.